Today my dog turns eight years old. Today I find myself wondering how eight years have passed since I saw the ad in the Spokesman-Review and called and reserved a puppy for my then fairly new boyfriend. I couldn’t really afford one, but Russ wanted a boxer and by God, he was going to have one. And one Sunday in late October, we made the trip up to Post Falls and came home with Dexter (and some Krispy Kremes). We had no idea how to handle a puppy. We were puppies ourselves. Boxer puppies are exceptionally cute and I believe this is because they are exceptionally emotionally devastating. 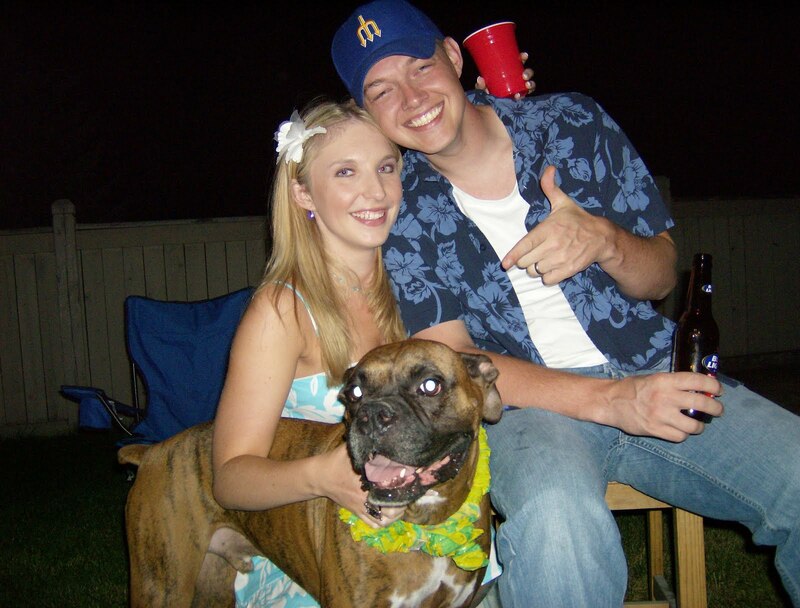 In his younger days, Dexter destroyed more property than Hurricane Earl and made us aware that we were not to keep him in a kennel, outside, or go anywhere without him. 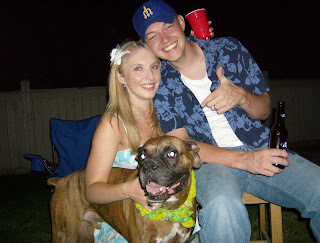 Apparently boxers have more separation anxiety than most breeds and this one had more than most boxers. Dexter did not live with me until after I married his daddy and I was perfectly fine with that. Once we did become roommates, he tore up my important papers and dove into the garbage and generally let me know who the boss was. The joke was on him, though, when I gleefully made the appointment to have him neutered. Eventually, Russ and I figured out that we didn’t have a bad dog… we just had a very smart, stubborn dog who was trying to communicate with us. Once we figured him out, we were able to successfully train him and compromise with him (yes, we compromised with our dog) and eventually we were left with a very pleasant animal who gave us minimal trouble. It only took about four years, hundreds of tears, thousands of dollars in damages, about a dozen marital rifts, two training books, millions of treats and a plethora of patience. There was also one incident where we underestimated his strength that resulted in an empty tray where Christmas cookies had once been. But even then, as my parents pointed out (it was their tray of cookies) he wasn’t trying to hurt anyone… he simply saw an opportunity and took it in the form of a dozen peanut butter balls and two dozen sugar cookies with the little Hershey’s kisses in them. I never thought I’d say this, especially after he tore up my $400 Love Sack bean bag chair, but I wouldn’t change one bit of it. I was strictly a cat person before Dexter and he has changed me to a dog person for life. There is nothing like dog ownership. We really are his love, his life, his family, the ones he would do anything to protect. When I walk through the door, he acts as if he hasn’t seen me in decades, as if he really believed I’d left him and wouldn’t return. He takes such pleasure in eating, sleeping, getting pats on the head, and walks, I can’t help but be inspired to take joy in the simple things myself. We walk the same path nearly every day but he always acts as if he’s seeing it for the first time. And oh, my God, the way he acts when he learns he gets to ride in the car… it’s like he’s won an Oscar. He follows me from room to room without asking for anything, just to be near me. I haven’t owned anything more valuable than that. Dexter has grown with us throughout practically our entire relationship. When Russ left him at his parents’ house for nine months to go to school in Wyoming, Dexter slept faithfully on Russ’s old shirt the entire time. The night I got the call that brain cancer had claimed my grandmother; Dexter was so anxious to comfort me that he spilled a glass of wine on his own head (and tried to lick it off). Whenever I return from a trip, I know he’ll be at the top of the stairs when I open the door, shaking as he waits for me to lug my big pink suitcase through the door before barreling downstairs to greet me. Today we’re celebrating him like we’ve done every possible September 19 prior: extra love, extra walks, and a cupcake (vanilla… he survived 36 chocolate Christmas cookies, no need to push our luck). But this birthday is hard. Though he still acts like a puppy, eight isn’t young for dogs. Eight is especially not young for big dogs. I can’t help but think of the heartbreak that lies ahead of us. I know when you get a pet you’re just biding your time until the heartbreak and it’s a pain I know all too well. The loss is the result of having pets who aren’t just pets, but part of the family. I’m trying not to dwell on it, but it’s like the year when people’s birthdays stop being funny… his birthdays are no longer funny. Still, I wouldn’t trade the impending heartache for the experiences with Dexter and the lessons he’s taught me. The stories of his life will live on long after he does, from the day he ate the dryer lint to the evening we tormented him with the sound of the buzzer from our “Taboo” game only to find it mangled and chewed up the next morning. He has taught me lessons in responsibility, selflessness, patience and understanding while giving me more unconditional love that I could possibly deserve. I’m so grateful we’ve had him for eight healthy years and will do my best to greet each of his remaining days with the same enthusiasm that he does.